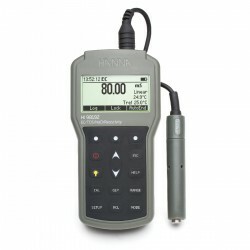 The HI98197 is a rugged portable EC/TDS/Resistivity/Salinity meter with the performance and features of a benchtop. 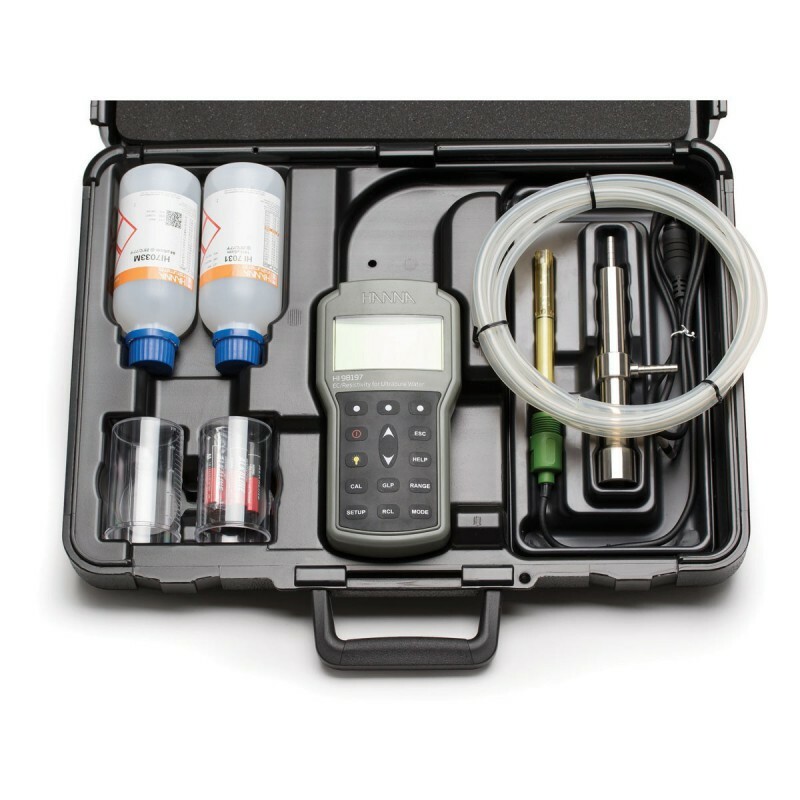 The HI98197 is supplied complete with all accessories necessary to perform high purity water measurements packaged into a durable carrying case. 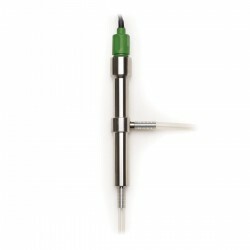 The accessories include a stainless steel flow cell and a threaded four ring conductivity probe that allows for high resolution 0.001 μS/cm for conductivity and 0.1 MΩ * cm for resistivity readings. 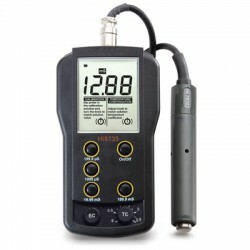 The HI98197 is supplied with a specialized HI763123 four-ring conductivity probe that not only allows for a 0.001 μS/cm resolution measurement but also has screw type threads for insertion into the HI605453 AISI 316 stainless steel flow cell. 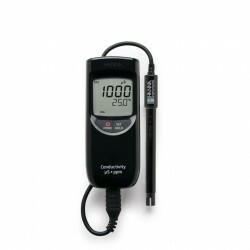 The HI763123 has a built-in temperature sensor and a adjustable temperature coefficient for accurate readings that cover a complete range with a single sensor. The four-ring technology also eliminates the polarization effect that is common with standard two pole versions. 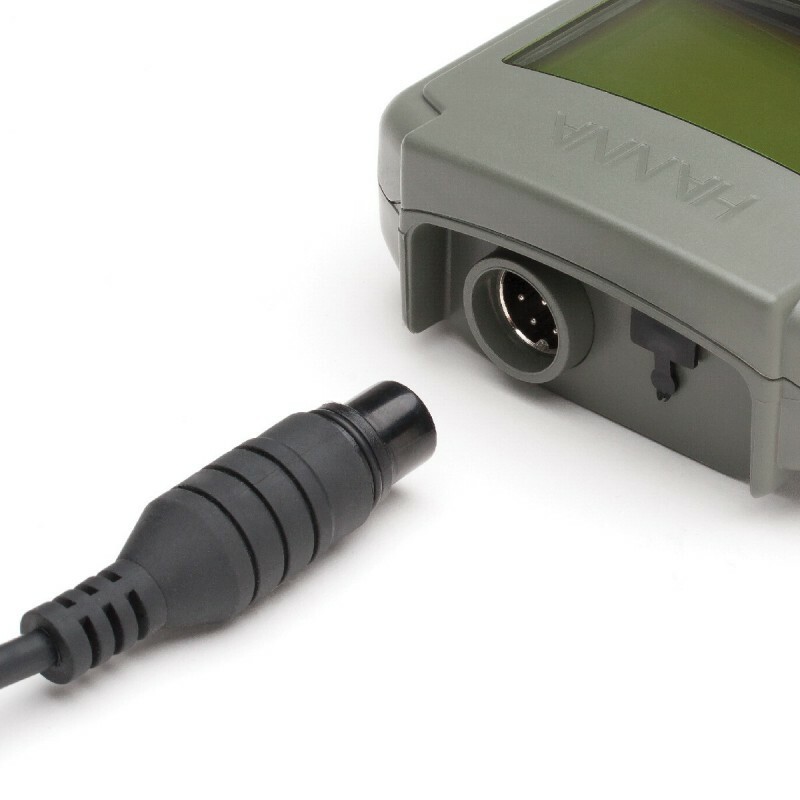 The HI763123 conductivity probe connects to the meter with a unique quick connect waterproof DIN connector allowing for a secure attachment without a threaded connection that is also easy to remove. 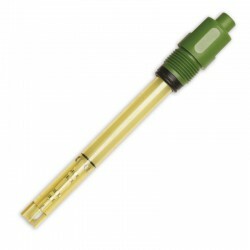 High purity water used in power generation, semiconductor manufacturing and other industries can be difficult to measure can be difficult to measure due the ability of carbon dioxide (CO2) to diffuse into water and forming carbonic acid (H2CO3). The carbonic acid will dissociate into hydrogen ions (H+) and bicarbonate ions (HCO3). 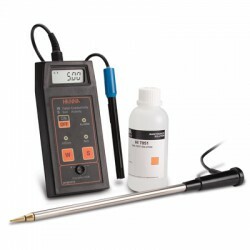 These ions will increase the conductivity and decrease the resistivity of the water. 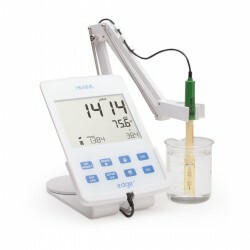 In order to measure high purity water accurately it is necessary to perform a continuous flow measurement. 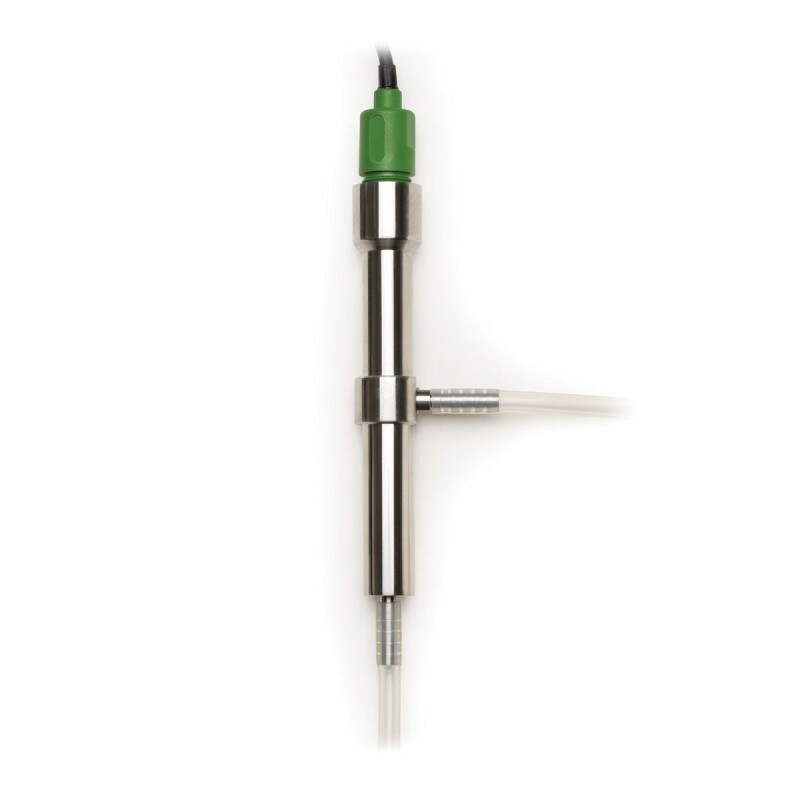 The HI98197 uses the HI763123 four ring probe with a threaded connection that is screwed into a stainless steel body flow cell. 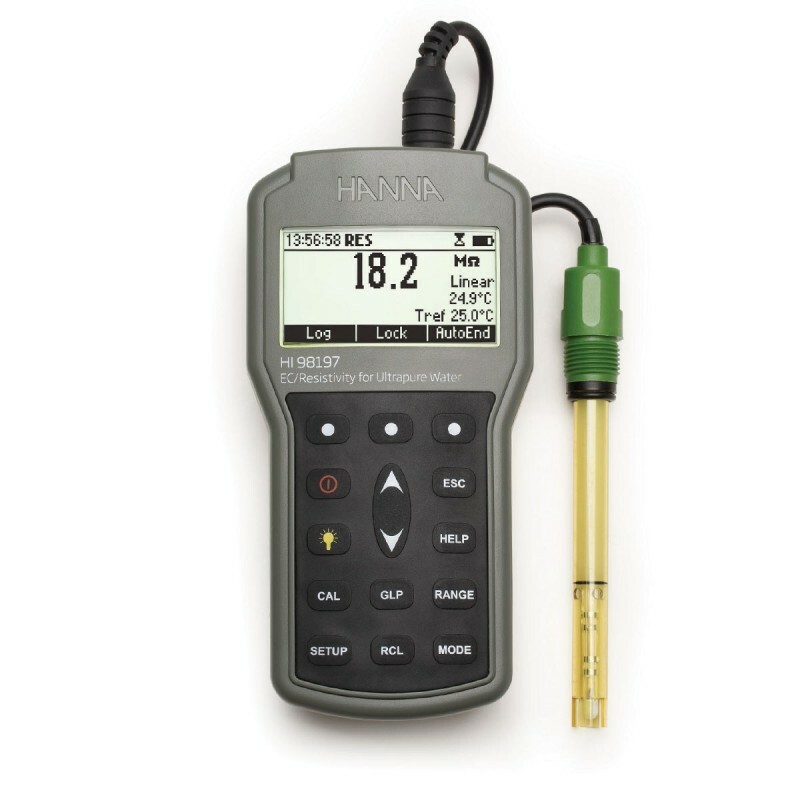 The flow cell is connected to a water source to determine the conductivity or resistivity whichever is preferred. The HI98197 is an ideal meter for monitoring the mixed bed resin or equivalent system that produces high purity water of 18.2 MΩ * cm at 25 °C. 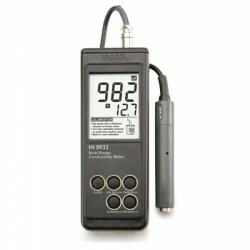 Expanded Ranges - HI98197 has an expanded conductivity range from 0.000 μS/cm to 1000 mS/cm actual conductivity (400 mS/cm temperature compensated). The HI98197 also has ranges for TDS, resistivity and three salinity scales. 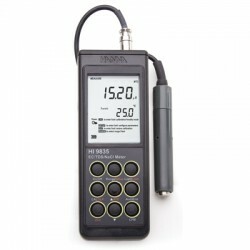 This meter automatically recognizes the probe type (two or four ring) and allows the user to adjust the nominal cell constant.